Casa Kate is about the view…and the light. The three levels of Casa Kate spill down the side of the eastern slope of San Miguel’s hills overlooking the Jardin, San Miguel’s central square, and the beautiful Parroquia, the town’s landmark church (we’re sure it is the most photographed location in Mexico), and the location of the start of Mexico’s 1810 War of Independence. The front of Casa Kate opens out to the spectacular vista, and each main room, except the kitchen, has a view of the town or the patio and private garden. 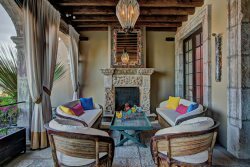 Designed by renowned Mexican architect, Patsy Bubela, the house features vaulted ceilings, thick walls, nichos, imbedded antiques, molded plaster shells. Sun illuminates the interior through French doors, windows, and shutters, which when opened in San Miguel’s normal perfect weather, provide indoor/outdoor living. You probably will spend most of your time on the azotea (roof-top patio) simply taking in the view. But the house is located within the desirable Centro district, which comprises the UNESCO WORLD HERITAGE SITE. Walk out the door, and you are in town; five minutes down a cobblestone street and you are in the central square. Overall, the home has a warm, traditional, colonial esthetic, but its décor is simple and uncluttered, giving the house an elegant, bright, sophisticated feel. Elements reflect the heritage of Southern Spain and North Africa which form the architectural lineage of San Miguel. You enter the house through a wooden gate, then cross over a brick entry way lined with macetas full of hibiscus, palms, ferns and bromeliads. Then through antique wooden doors into the open-plan living room, dining room. Most people, drawn by the spectacular view, immediately walk through the living room to the French doors opposite and out onto the small balcony to take in the stunning panorama. In the living room is a large fireplace fronted by leather chairs and a sofa. The walls display paintings created by artists whose works are displayed in many of the great museums of Europe and Mexico. Oriental carpets sprawl over the dark tile floor. Light enters through a cupola over the dining area: a glass-top table set on a carved cantera stone column, surrounded by six chairs copied from those used in a Spanish villa. Off the living room, through a short hall, are the master bedroom and bathroom. The bedroom has a ‘boveda’ ceiling (a dome made of brick), a fireplace, king size bed with a pillow-top mattress. French doors lead to a small balcony overlooking the garden and town. Another window gives onto an interior patio and fountain. There is a large closet. The master bathroom has a tub and shower. Original tiles cover the walls. Behind an antique mirrored door leading off the living/dining room is the kitchen. It was completely renovated in 2012 and features intricate tile work and cabinets made from doors imported from Syria, and a small dining nook. There is all you need to cook at home: a gas four burner range and oven, refrigerator/freezer, microwave, toaster oven, toaster, coffee maker, and plates, silverware, etc. Off the living room a trompe l’oeil scene of North Africa leads to a spiral staircase down to two guest bedrooms and bathroom which are decorated in a North African motif, paying homage to San Miguel’s mudéjar architectural heritage of sixteenth century Andalucia. The ‘Morocco room’ is decorated to give the feeling of being in a Saharan tent; white canvas drapes from the ceiling. Appliqued bedspreads from Egypt, rugs from Tunisia, a susani throw on the daybed. Two twin beds and a large closet. 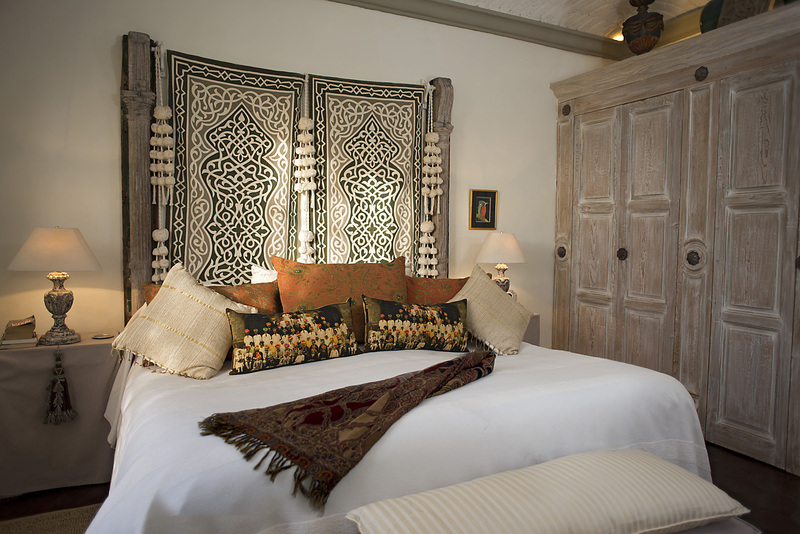 The ‘Berber room’ has a queen bed set up to look like a large divan with oversized pillows from Morocco. Behind it hangs a primitive carpet from Iran. The floor is strewn with rugs from Turkey, Morocco and Tunisia. The room has a fireplace, a desk, and its own balcony over the garden. French doors of both bedrooms open to the downstairs patio, which in turn leads down to the sunken garden. The bedrooms can also be accessed from the outside down an iron staircase that communicates all three levels, adding to their privacy. As mentioned, you probably will spend much of your time on the roof-top patio on the third level at the tree tops among hummingbirds. Great for entertaining. Olive trees, large, comfortable chairs, umbrellas and the incomparable view (you can make out the bull ring a few blocks below the house). Spectacular sunsets silhouette the spires of the Parroquia church. On the roof level with the azotea, is a ‘party room’ which, behind a wood paneled wall, contains a 40” hd television hooked to cable. Open the iron shutters and the room has its own magnificent vista of the town. The room has its own fireplace and a bench and table for games or upstairs dining. On a rear patio behind the party room is a gas barbecue.